The closest airports to Alberobello are Bari and Brindisi. Bari is the closest to Alberobello and there are regular shuttle buses from the airport to the railway station and from there to Alberobello. The trip from Bari to Alberobello takes one and a half hour. The two-way ticket’s cost from Bari to Alberobello is around 10 euros. If you have a car, getting from Bari to Alberobello is even easier. Getting here from Bari will take you about one hour on SS100 and SS172. Close to Brindisi there is Lecce – another Italian town, worth visiting if you are in this region. 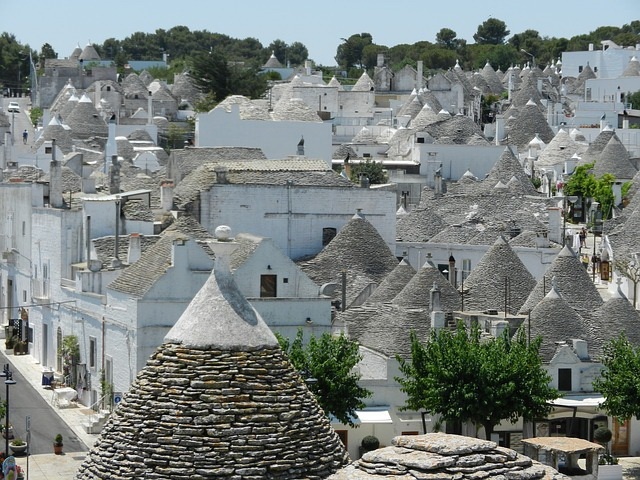 Especially taking into consideration the fact that Alberobello is a small town – good for maximum two-three days long trip, visiting the surrounding towns might be a good idea. Martina Franca is another town worth visiting once you are in Alberobello, its baroque center will surely captivated one’s eyes.